Site of 2004 “Black Party” where Jamal Segars was killed; area was filled with pedestrians and bumper-to-bumper traffic. Thelonious Searcy (r, seated) listens as his attorney Michael Dezsi plays Vincent Smothers’ confession into the record March 19. Smothers is on stand with head bowed. DETROIT – In addition to Vincent Smothers’ confession on the stand to the murder of Jamal Segars during a Sept. 4, 2004 “Black Party” outside Detroit City Airport, other stunning discrepancies in the prosecution’s case at trial against Thelonious Searcy surfaced during the fourth part of his evidentiary hearing May 15. A police report confirming the collision, not raised at trial or further investigated by DPD. Witness confirmation of the collision and police gunfire. Assistant Prosecutor Timothy Chambers asked Sgt. 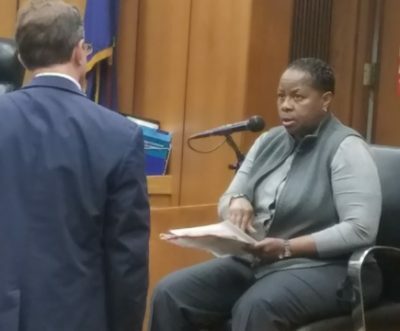 Patricia Little, a “prosecuting detective” from the Wayne County Prosecutor’s Office, about the bullet from a sealed envelope examined in her presence at the Michigan State Police crime lab during an inspection Judge Timothy Kenny ordered earlier. She also testified to the medical examiner’s discovery of a second bullet in Segars’ neck. Both were later identified as .40 caliber bullets. On cross-exam, Dezsi presented a note from trial judge Timothy Kenny responding to a trial jury inquiry about what caliber bullet(s) were found in Segars’ body. After Chambers’ objection, Little did not respond. PAGE FROM INVESTIGATOR’S REPORT AT SCENE SAYS CASING ON REAR OF CORVETTE WAS 40 CAL., NOTES NUMEROUS .45 CAL. CASINGS IN PARKING LOT WHERE POLICE CAR/MARAUDER COLLISION TOOK PLACE. Also during cross examination, Little admitted to Dezsi that a white tag identifying a 9 mm casing inside an envelope was generated when she picked up evidence from the police property office “a couple of months ago.” She agreed that a 9 mm shell casing was included on a property room inventory report Sept. 16, 2004. Little responded in the affirmative. Sgt. 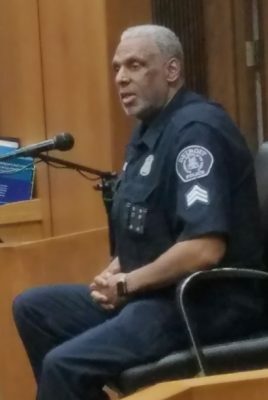 William Anderson, who was working in the Homicide Unit at the time of the Segars killing, and became the Chief Investigative Officer in the case, took the stand next. Anderson read the memo, shown below, into the record. Atty. Christian is deceased and was not available to testify. Anderson said the DPD keeps books with yearly lists of homicides. He said each listing has a number, name of complainant [deceased], location of crime, fatal or non-fatal, cause of death, homicide file number, and detectives assigned. Anderson responded in the affirmative. 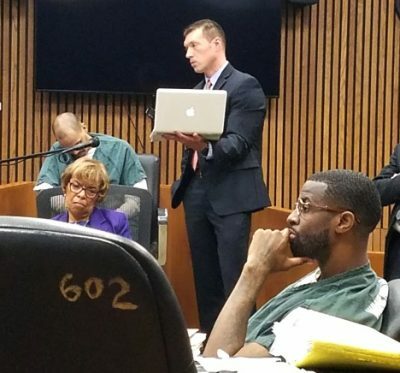 Dezsi told VOD after the hearing that he was raising the possibility that the burgundy Marauder driver referred to in the memo may have taken the victim to a hospital outside of Detroit if he had a criminal record, and the fatality would not have appeared in the Detroit journal. Dezsi then introduced into evidence a police report regarding a police car collision with the burgundy Marauder. “Some of your officers in an unmarked car were involved in a collision with another car, which is what the letter from Kathy Christian says to you,” Dezsi said to Anderson, who reiterated that he didn’t recall seeing that letter. 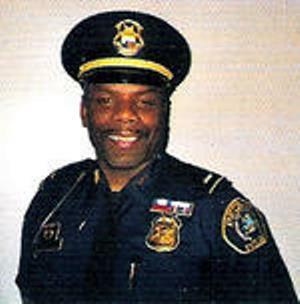 Lt. Roy McCalister Jr. is now a Detroit City Council member. 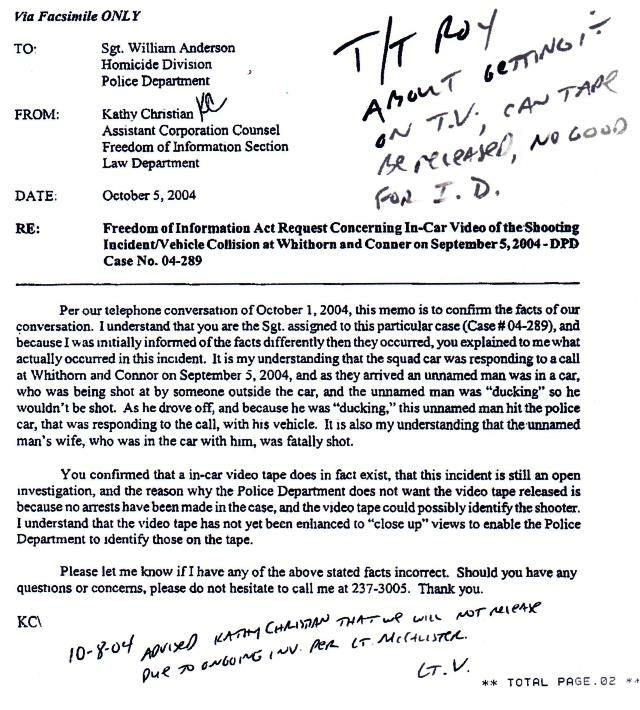 Anderson said handwritten initials on the bottom of the note belonged to Lt. Roy McAlister and Lt. Ventavogel, but that there were no notes from him. Anderson responded in the negative. Deszi then introduced a written statement by witness Latasha Boatwright, which he said she also testified to at Searcy’s preliminary exam. 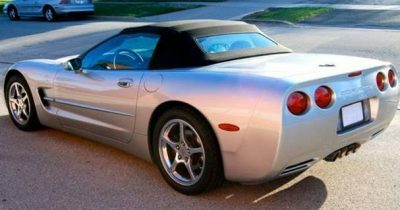 Jamal Segars was driving a Corvette convertible like this, with the top down, according to Vincent Smothers. Anderson said that was not clear. Judge Timothy Kenny (r) holds sidebar conference with AP Chambers and Atty. Dezsi at conclusion of hearing. Anderson responded that there were no shell casings recovered that would indicate the officers fired their guns, and that he would have called in a second investigative team if that had been the case. Dezsi then asked Anderson if he had reason to believe that a 9 mm shell casing was collected from the scene, referencing the inventory and evidence tag Sgt. Little identified. Anderson replied in the affirmative. Dezsi also asked about Kenny’s note to the jury and the fact that bullets found in Segars’ body were identified as .40 caliber. Dezsi then asked Anderson if he recalled testimony that a .45 caliber gun was found when Searcy was arrested at his grandmother’s home. Asst. Prosecutor Chambers interjected that a .45 cal shell casing found on the trunk of Segars’ car matched the gun found in Searcy’s [grandmother’s] house. Smothers earlier testified on the stand and in written affidavits that his accomplice Jeffery Daniels had a .45 caliber gun that he fired into the air during the City Airport killing. 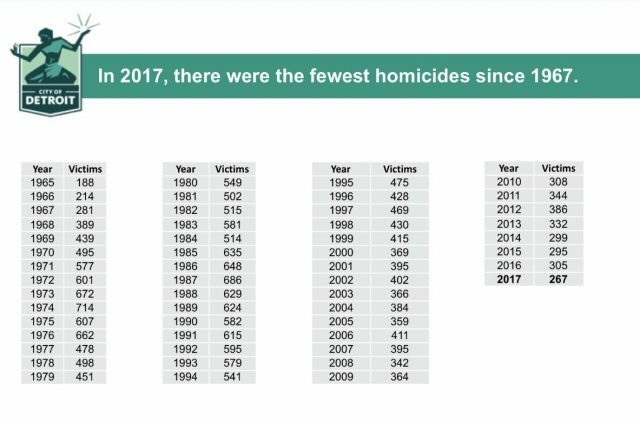 City graph shows 384 homicides in 2004. 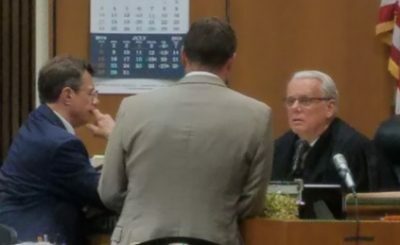 During the trial, Searcy’s relatives testified that Daniels had left the gun at Searcy’s grandmother’s house after taking her to the supermarket, and that it did not belong to Searcy. The investigator’s report shown above references a number of .45 caliber shell casings found in the parking lot where the Marauder collision occurred. Detroit police officers regularly use .45 caliber bullets. Judge Kenny asked that the prosecution locate the DPD homicide journal for 2004, and said that he felt that both sides should be able to come to an agreement about the second alleged homicide after studying that book. He asked that both sides submit their briefs summarizing their positions to him by June 15. 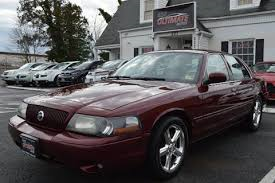 He admitted both the police report about the collision with the Marauder and the Boatwright statement into evidence. He announced a motion hearing date of June 29. 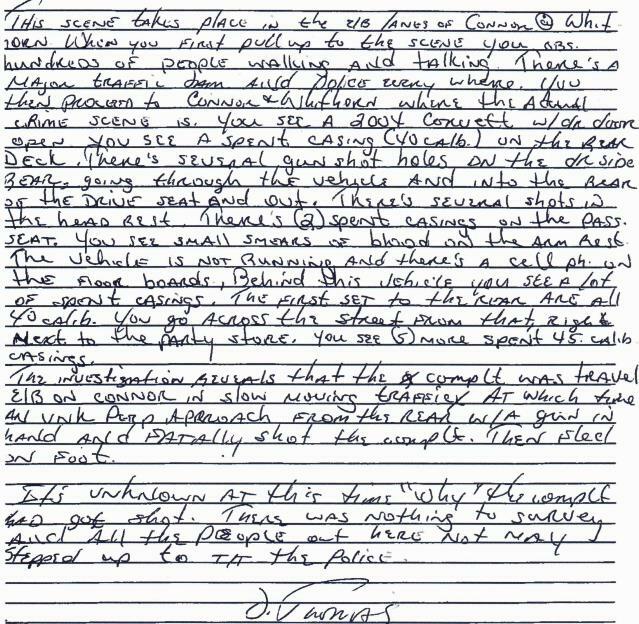 Kenny also released his writ on Searcy, sending him back to the Thumb Correctional Facility and out of terrible conditions in the Wayne County Jail. Searcy waved to his dozens of supporters as he left the courtroom.